Palahiko Mana, Water-Drinking Maiden, Hopi 1899. She wears a headdress with stepped Earth signs and corn ears. Water Drinking Woman seems to be a name for the corn itself, one of many forms of the . Drawings of kachina dolls, from an 1894 anthropology book. A kachina (/kəˈtʃiːnə/; also katchina, katcina, or katsina; Hopi: katsina is the plural /kətˈsiːnə/) is a spirit being in the religious beliefs of the Pueblo people, Native American cultures located in the southwestern part of the United States. In the Pueblo culture, kachina rituals are practiced by the Hopi, Zuni, Hopi-Tewa and certain Tribes, as well as in most Pueblo Tribes in New Mexico. The kachina concept has three different aspects: the supernatural being, the kachina dancers, and kachina dolls, small dolls carved in the likeness of the kachina, that are given only to those who are, or will be responsible for the respectful care and well-being of the doll, such as a mother, wife, or sister. The central theme of the kachina [religion] is the presence of life in all objects that fill the universe. Everything has an essence or a life force, and humans must interact with these or fail to survive. Kachina dolls in the Heard Museum in Phoenix, Arizona. The exact origin of the kachinas is not completely known, but according to one version of Hopi belief, the kachinas were beneficent spirit-beings who came with the Hopis from the underworld. The underworld is a concept common to all the Pueblo Indians. It is a place where the spirits or shades live: the newly born come from there and the dead return there. The kachinas wandered with the Hopis over the world until they arrived at Casa Grande, where both the Hopis and the kachinas settled for a while. 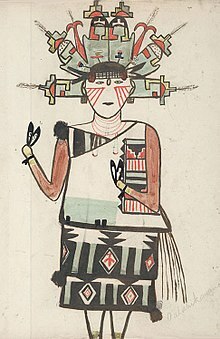 With their powerful ceremonies, the kachinas brought rain for the crops and were in general of much help and comfort. Unfortunately, all of the kachinas were killed when the Hopis were attacked by enemies and their souls returned to the underworld. Since the sacred paraphernalia of the kachinas were left behind, the Hopis began impersonating the kachinas, wearing their masks and costumes, and imitating their ceremonies in order to bring rain, good crops, and life’s happiness. Another version says that in an early period, the kachinas danced for the Hopis, bringing them rain and all the many blessings of life. But eventually, the Hopis came to take the kachinas for granted, losing all respect and reverence for them, so the kachinas finally left and returned to the underworld. However, before they left, the kachinas taught some of their ceremonies to a few faithful young men and showed them how to make the masks and costumes. When the other Hopi realized their loss, they remorsefully turned to the human substitute of kachinas, and the ceremonies have continued since then. In many ways the Kachina Cult and its rituals are the most important ceremonial observances in the Hopi religious calendar. Within Hopi religion, the kachinas are said to live on the San Francisco Peaks near Flagstaff, Arizona. To the Hopis, the name primarily refers to the supernatural beings who visit the villages to help the Hopis with everyday activities and act as a link between gods and mortals. These spirits are then impersonated by men who dress up in costumes and masks to perform ceremonial dances throughout the year. The most highly anticipated ceremony is the Powamuya Ceremony (bean dance). There are hundreds of different kachinas practiced by the Hopi. In addition, the wooden carvings of these spirits are also made to give to the children to help them identify the many kachinas. Overall, the kachinas can generally be said to represent historical events and things in nature, and are used to educate children in the ways of life. The Hopi are not the only Pueblo tribe to observe the Kachina Cult in its religious calendar. 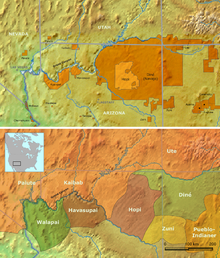 The Zuni also have a religious solar calendar which is practiced year-round. 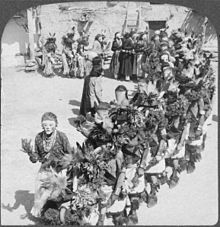 The Zuni Kachina Cult is one of the six major cults of Zuni. There are a number of kachinas that represent space and time in the Zuni religion. One of the most famous and widely known ceremonies is the Shalako Ceremony. There are a number of other ceremonies and rituals; some are public, however, many of them are kept in secret. It is hard to specify the total number of kachinas in the Zuni religion because the Zuni do not believe in using or exploiting their kachinas for open public economic gain and believe they should be kept in private. It is believed that some of the older kachina rituals are no longer practiced, but there are new ones that have been introduced. In addition, it is believed that there are hundreds of different kachina rituals that are practiced in the Zuni religion. The Zuni Kachina Cult is not constant, it changes to space and time. The Zuni believe that the kachinas live in the Lake of the Dead, a mythical lake which is reached through Listening Spring Lake. This is located at the junction of the Zuni River and the Little Colorado River. Although some archaeological investigations have taken place, they have not been able to clarify which tribe, Zuni or Hopi, developed the Kachina Cult first. Both Zuni and Hopi kachinas are different from each other but have certain similarities and features. In addition, both Zuni and Hopi kachinas are highly featured and detailed, while the kachinas of the Rio Grande Pueblos look primitive in feature. The Hopis have built their cult into a more elaborate ritual, and seem to have a greater sense of drama and artistry than the Zunis. On the other hand, the latter have developed a more sizable folklore concerning their kachinas. 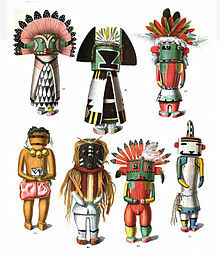 Kachina dolls are small brightly painted wooden “dolls” which are miniature representations of the masked impersonators. 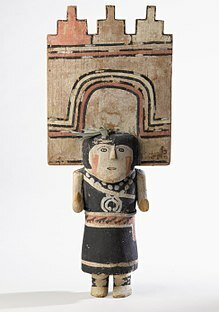 These figurines are given to children not as toys, but as objects to be treasured and studied so that the young Hopis may become familiar with the appearance of the kachinas as part of their religious training. During Kachina ceremonies, each child receives their own doll. The dolls are then taken home and hung up on the walls or from the rafters of the house, so that they can be constantly seen by the children. The purpose of this is to help the children learn to know what the different kachinas look like. It is said that the Hopi recognize over 200 kachinas and many more were invented in the last half of the nineteenth century. Among the Hopi, kachina dolls are traditionally carved by the maternal uncles and given to uninitiated girls at the Bean Dance (Spring Bean Planting Ceremony) and Home Dance Ceremony in the summer. These dolls are very difficult to classify not only because the Hopis have a vague idea about their appearance and function, but also because these ideas differ from mesa to mesa and pueblo to pueblo. Many Pueblo Indians, particularly the Hopi and Zuni, have ceremonies in which masked men, called kachinas, play an important role. Masked members of the tribe dress up as kachinas for religious ceremonies that take place many times throughout the year. These ceremonies are social occasions for the village, where friends and relatives are able to come from neighboring towns to see the “dance” and partake in the feasts that are always prepared. When a Hopi man places a mask upon his head and wears the appropriate costume and body paint, he believes that he has lost his personal identity and has received the spirit of the kachina he is supposed to represent. Besides the male kachinas are many female kachinas called kachin-manas, but women never take the part of male and female kachinas. Hopi clowns are an integral part of Hopi Kachina ceremonials where they participate in sacred rituals as well as unique clown performances—some with direct contact with the spectators. The clown’s performance centers on humor and entertainment, but also they monitor the assembled crowd and provide policing activities over both the Kachina performers and the audience. Mockery is a tool used to warn spectators of non-Hopi behavior, and generally long remembered by the recipient of clown attention. The Hopi have four groups of clowns, some are sacred. Adding to the difficulty in identifying and classifying these groups, there are a number of kachinas whose actions are identified as clown antics. Barton Wright’s Clowns of the Hopi identifies, classifies, and illustrates the extensive array of clown personages. ^ Sacred Women in North American Rock Art, August 20, 2011. Image is from the Bureau of American Ethnology 21st Annual Report. ^ Colton, Harold Sellers (1959). Hopi Kachina Dolls: with a Key to their Identification (rev. ed.). Albuquerque: University of New Mexico Press. pp. 1–3. ^ Wright, Barton; Evelyn Roat (1965). This is a Hopi Kachina. USA: Museum of Northern Arizona. p. 4. ^ Barton, Wright (2008). “Hopi Kachinas: A Life Force”. Hopi Nation: Essays on Indigenous Art, Culture, History, and Law. USA: Univ. of Nebraska Digital Commons. pp. Ch. 4. 6.3. Retrieved 2010-06-22. ^ Dockstader, Frederick J. (1954). The Kachina and the White Man: a study of the influences of White culture on the Hopi kachina cult. Bloomfield Hills, Mich.: Cranbrook Institute of Science. pp. 10–11. ^ Dockstader, Frederick J. (1954). The Kachina and the White Man: a study of the influences of White culture on the Hopi kachina cult. Bloomsfield Hills, Mich.: Cransbrook Institute of Science. p. 9. ^ Dockstader, Frederick J. (1954). The Kachina and the White Man: a study of the influences of White culture on the Hopi kachina cult. Bloomfield Hills, Mich.: Cransbrook Institute of Science. pp. 28–29. ^ Colton, Harold Sellers (1959). Hopi Kachina Dolls: with a Key to their Identification. Albuquerque: University of New Mexico Press. pp. 5–6. ^ Colton, Harold Sellers (1959). Hopi Kachina Dolls: with a Key to their Identification (rev. ed.). Albuquerque: University of New Mexico Press. pp. 2–4. ^ Stephen, Alexander. Hopi Journal of Alexander M. Stephen”. Edited by E. C. Parsons. Columbia University Contributions to Anthropology, 23, 2 volumes; 1936. P411-12. ^ Wright, Barton. Clowns of the Hopi”. Northland Publishing; ISBN 0-87358-572-0. 1994. Anderson, Frank G. (1955). The Pueblo Kachina Cult: A Historical Reconstruction. Southwestern Journal of Anthropology, 11, 404-419. Anderson, Frank G. (1956). Early documentary material on the Pueblo kachina cult. Anthropological Quarterly, 29, 31-44. Anderson, Frank G. (1960). Inter-tribal relations in the Pueblo kachina cult. In Fifth International Congress of Anthropological and Ethnological Sciences, selected papers (pp. 377–383). Dockstader, Frederick J. The Kachina & The White Man: A Study of The Influence of White Culture on The Hopi Kachina Cult, Bloomfield Hills, Michigan: Cranbook Institute of Science, 1954. Dozier, Edward P. (1970). The Pueblo Indians of North America. Holt, Rinehart, and Winston. Glenn, Edna “Kachinas,” in Hopi Nation: Essays on Indigenous Art, Culture, History, and Law, 2008. Kennard, Edward A. & Edwin Earle. “Hopi Kachinas.” New York: Museum of The American Indian, Hye Foundation, 1971. Schaafsma, Polly. (1972). Rock Art in New Mexico. Santa Fe: State Planning Office..
Schaafsma, Polly (Ed.). (1994). Kachinas in the pueblo world. Albuquerque, NM: University of New Mexico Press. Schaafsma, Polly; & Schaafsma, Curtis F. (1974). Evidence for the origins of the Pueblo katchina cult as suggested by Southwestern rock art. American Antiquity, 39 (4), 535-545. Schlegel, Alice, “Hopi Social Structure as Related to Tihu Symbolism,” in Hopi Nation: Essays on Indigenous Art, Culture, History, and Law, 2008. Sekaquaptewa, Helen. “Me & Mine: The Life Story of Helen Sekaquaptewa.” Tucson, Arizona: University of Arizona Press, 1969. Stephen, Alexander M. “Hopi Journal.” New York: Columbia University Press, 1936. Stephen, Alexander. Hopi Journal of Alexander M. Stephen”. Edited by E. C. Parsons. Columbia University Contributions to Anthropology, 23, 2 volumes; 1936. Stewart, Tyrone. Dockstader, Frederick. Wright, Barton. “The Year of The Hopi: Paintings & Photographs by Joseph Mora, 1904-06.” New York, Rizzoli International Publications, 1979. Talayesua, Don C. “Sun Chief: The Autobiography of a Hopi Indian.” New Haven, Connecticut: Institute of Human Relations/Yale University Press, 1942. Titiev, Mischa. “Old Oraibi: A Study of The Hopi Indians of the Third Mesa.” Cambridge, Massachusetts: Peabody Museum, 1944. Wright, Barton. “Hopi Kachinas: The Complete Guide to Collecting Kachina Dolls.” Flagstaff, Arizona: Northland Press, 1977. Wright, Barton, “Hopi Kachinas: A Life Force,” in Hopi Nation: Essays on Indigenous Art, Culture, History, and Law, 2008.